Some say we eat with our eyes and some go even further to say that if the food ain't pretty to look at, it isn't worth eating at all. For me, I do enjoy a nicely plated and composed dish, but really, it is all about the flavours and execution. Don't even get me started on this because many of the most delicious Asian foods are not particularly photogenic. That is basically the concept at the newish Ugly Dumpling which took over the ol' Merchants Workshop. 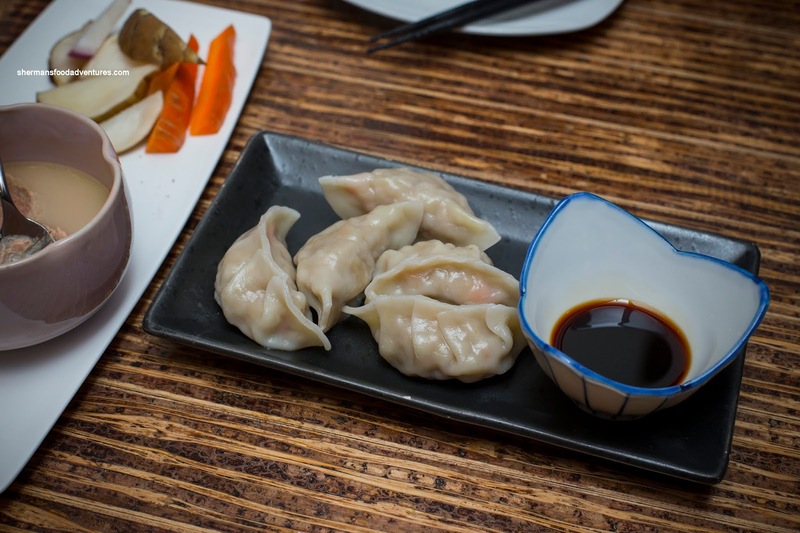 With Japanese and Chinese influences, the menu is definitely Asian-inspired, but really it is all-over-the-place. Yes, the food isn't particularly IG worthy, but again, if it tastes good... Recently, I visited the place with Steph. 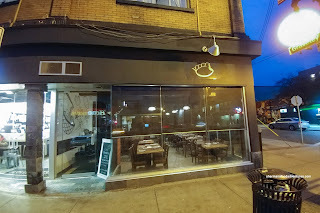 We decided on the 10-course tasting menu priced at a reasonable $60.00. Wine pairings were very affordable at $30/$40 (3/4 pours). 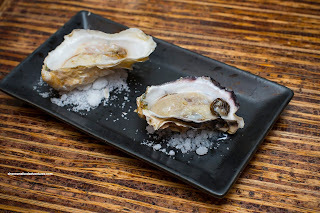 We were started off with the a pair of Marina's Gold Oysters with cedar-aged vinegar and horseradish. This was a simple starter, but sometimes, simple is better. We found that the vinegar and horseradish was purposefully restrained where the natural sweet brininess of the oyster really came through. The oyster itself was creamy and delicate. 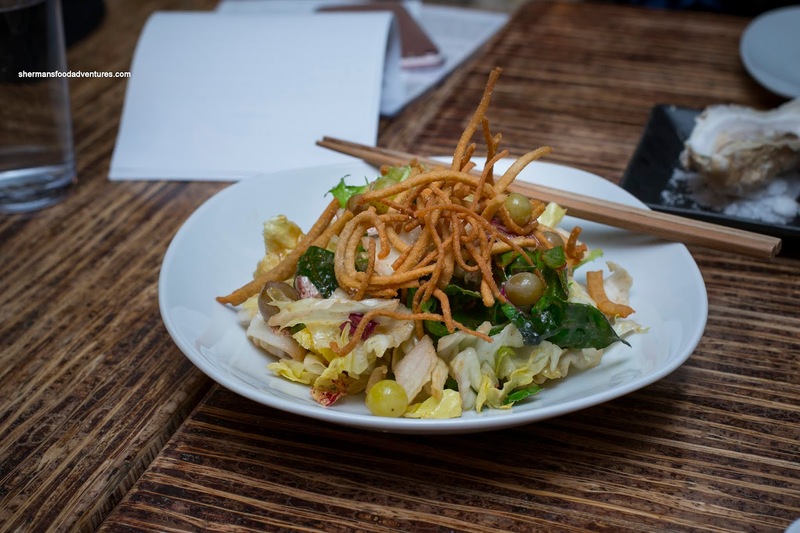 Next, we had the Winter Greens Salad with soba crackers, pickled grapes and miso dressing. Not overly complex on the surface, the salad ate typically until we got to the pickled grapes. Beyond the sweet tanginess, there was a pointed fermented taste that was akin to kombucha. Add in the crunch from the crunchy soba noodles and the salad was pleasant texturally as much as it was taste-wise. 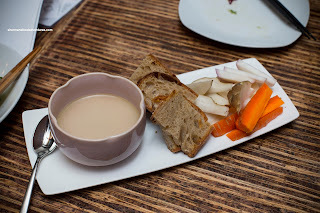 Accompanied by toasted bread, sunchoke, carrots and radish, the Chicken Liver Pate was creamy and aromatic. It was definitely on the sweeter side where it didn't really go with the sweet wine pairing. However, on its own, the silky-smooth pate was a great compliment to the earthy sunchokes. One thing that cannot be overstated is that they did not skimp on the portion size of the pate as there was more than enough for the bread and crudites. Now the place wouldn't be called Ugly Dumpling if they didn't offer up what we had next - Curry Pork Dumplings with vegetables. No, they weren't ugly. In fact, these were firm and tightly wrapped which kept the filling from being too loose. The meat was tender with texture while the veggies weren't overdone, which kept the everything from being mushy. Loved the thin dumpling skin as it was delicate with an appealing elasticity. Probably the most IGable dish was the Pine Mushroom Omelette with a side of king mushrooms. If there was ever a time where I could compliment the chef on perfect execution, this omelette would be it. Expertly folded and fluffy, the egg was teetering on the edge of barely cooked. 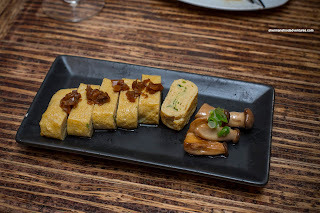 Sweet with earthiness provided by the mushrooms, each piece of omelette or should we say tamago, was a tasty cloud of fluffy heaven. Topped with the nori and green onions, the House-Cured Mentaiko and Egg Bowl was another subtle but tasty offering. 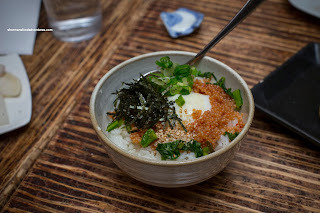 Texturally, the chewy rice was beautifully enveloped by the onsen egg which created a creamy silky "glue". The ample amount of cured mentaiko added a salty-brininess. 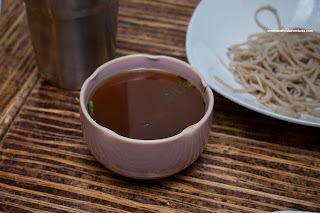 The umami quotient was kicked up a notch with the nori and the green onion provided brightness. Continuing the theme on seemingly simple dishes, we had the Steamed Ling Cod with XO sauce. This normally is accompanied by peanuts, sambal and dried shrimp, but with Steph being allergic to peanuts, we did without them. 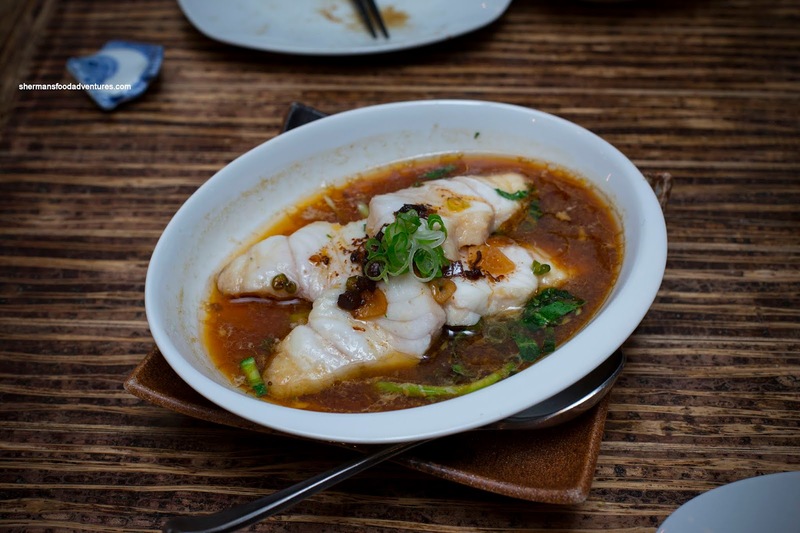 Buttery and soft, the ling cod was perfectly prepared. Beyond the usual savoury soy notes, the XO was pretty low-key where we knew it was there, but the spice and brininess was not overly strong. This may have been intentional because the ling cod could've been overwhelmed otherwise. 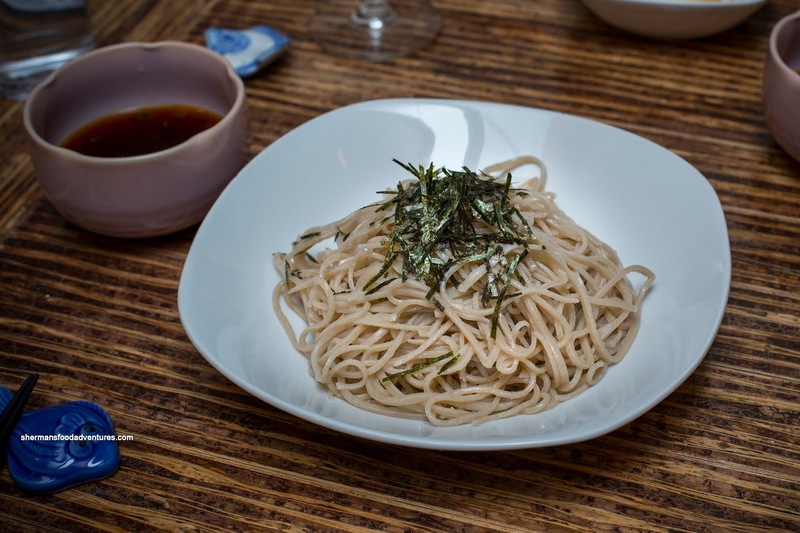 Technically, our last savoury item was the Homemade Zaru Soba. In terms of texture, the noodles were excellent maintaining a firm chewiness. The side of dipping sauce was mild and balanced. It wasn't to salty and exhibited the umaminess of bonito flakes. Not to waste the dipping sauce, we were presented with a thermos full of fish broth to mix it with. We simply poured as much as we wanted into the small bowl (naturally, more for mild and less from a bit saltier). This was neat and supposedly good for our skin. We finally made it to dessert where we were presented with Coconut Mochi with red bean and Quince Vanilla Pudding. We found the mochi to be nicely textured with a bit of chewiness to go with equal parts fluffiness. What threw us for a loop was the quice vanilla pudding as the little nuggets of tender quice were purple due to being poached. 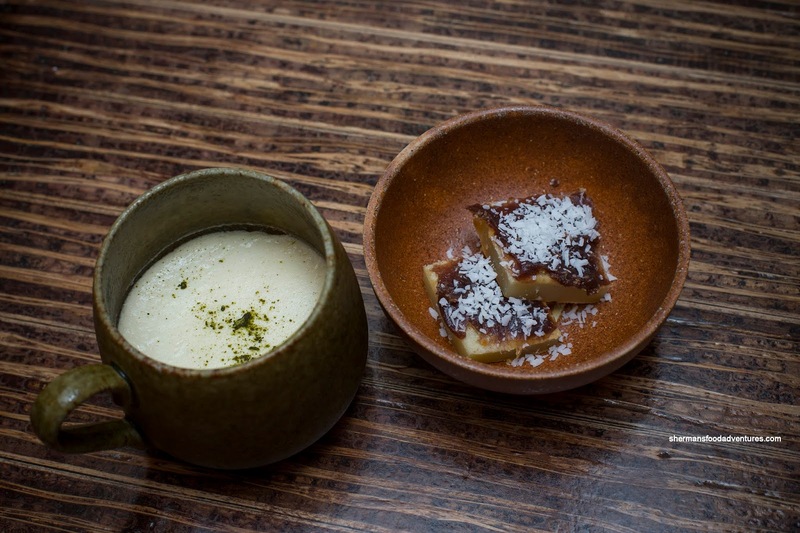 What really made this dessert appealing was the pudding as it was rich and creamy. Not too sweet either. All-in-all, the food we tried at Ugly Dumpling was pretty solid. Yes, nothing was particularly ground-breaking and honestly, to Asians, it can even be considered fairly typical. But prices are fair and service is good. Worth a try.